The below post is from the blog of Alison & Bobby’s good friend, Charles Scott. He’s an amazing dad who leaves this week on a cycling adventure with his two adorable children (6 & 12 yrs old). They will re-trace the Lewis & Clark trail on their bicycles, starting in St. Louis and ending in Portland. Along the way they will collect data for a roadkill project to protect animals, study botanical changes to the landscape since they 1800s and report their findings, develop materials to speak at schools nationwide, research historical sites, AND collect material for Charles’ second novel. Oh yeah, and produce a film. Phew! Suddenly sitting on the beach and staring at the ocean sounds a little too relaxed…. You can support his kickstarter here. You can see his blog and follow his summer adventure here. The photo tells it all. He’ll have to lug over 100 pounds of gear while riding so we simply had to help him train…. To get ready for our trip, I took a fully loaded training ride up steep, winding Perkins Memorial Drive in Bear Mountain State Park. I packed my panniers with all 7 hardcover books in the Harry Potter series and a bunch of other heavy stuff, maybe 75 pounds in total. I wanted to test my fitness and make sure the bike and attachments are in good working order. The equipment is fine. I'm in marginally acceptable shape, but need to get stronger by the time we hit the Rockies. My good friends Bobby and Alison Berna joined the outing. I thought they would give me moral support, but turns out they just wanted me to give them a romantic couples ride up the mountain. Okay, that's a joke. They actually rode their own bikes, pacing me, taking pics & video, and chuckling politely when I made nerdy jokes. They are good people. 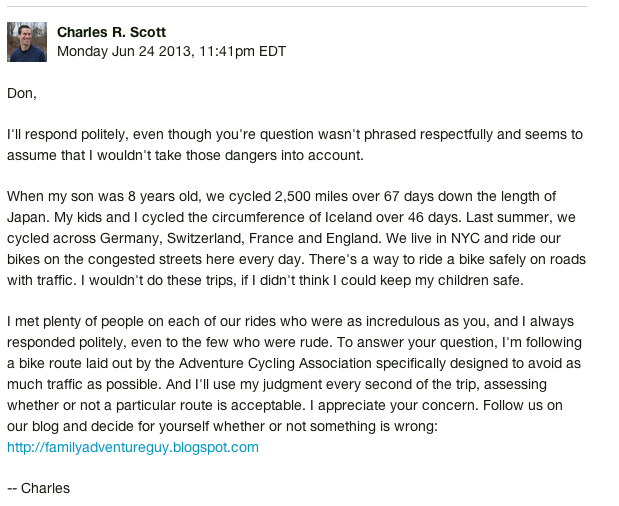 - Bike Snob NYC featured my family adventures on his blog. He's sarcastic, definitely out of line and inappropriate around polite company. I had tears in my eyes from laughing so hard at his post -- we're mentioned in the bottom half. Check it out here. Don't click if you're offended by profanity or cynicism. There will always be naysayers who discourage you from following an unconventional path. Respond politely, but do not let them change your course. An old saying goes, "The person who says it cannot be done should get out of the way of the person doing it." Yep.